Vaccines are one of the most powerful and cost effective health interventions available. Yet preventable diseases still cost millions of lives each year. Vaccine companies are a key link in the chain to each successful vaccination. The Access to Vaccines Index has compared key characteristics of each company included in the Index scope. The companies evaluated in the Index have diverse business models, reflected in their vaccine pipelines, portfolios, revenues and number of doses sold globally. 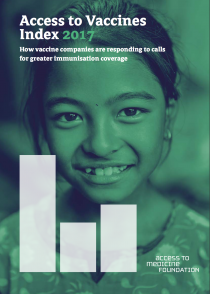 The industry is highly consolidated: the “big four” – GSK, Merck & Co., Inc., Pfizer and Sanofi – represent a large proportion (around 80%) of global vaccine revenues. While all companies within this group have very high vaccine revenues, there are also important differences between them: GSK and Sanofi have a large number of vaccines in their diverse portfolios, a relatively wide geographic spread and larger-than-average pipelines. Merck and Co., Inc. and Pfizer have smaller pipelines and portfolios, and sell fewer doses globally.